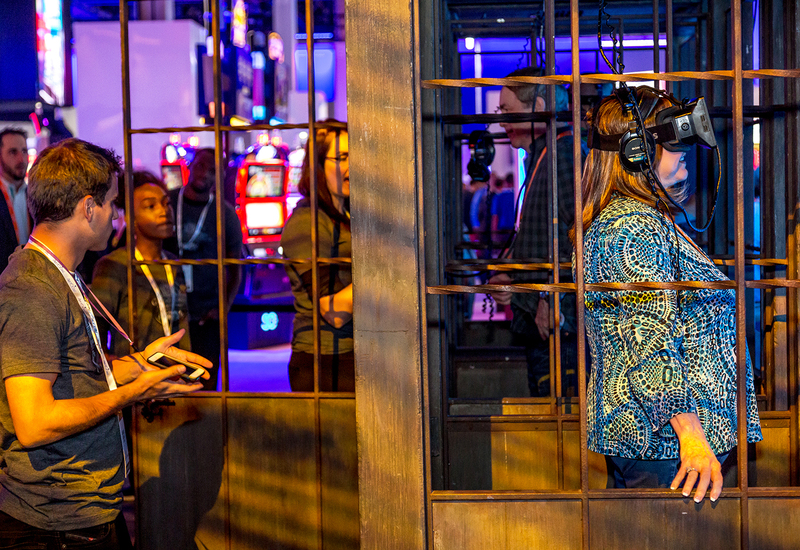 The Global Gaming Expo (G2E) is an international casino gaming trade show and conference held in Las Vegas that packs some stiff competition. 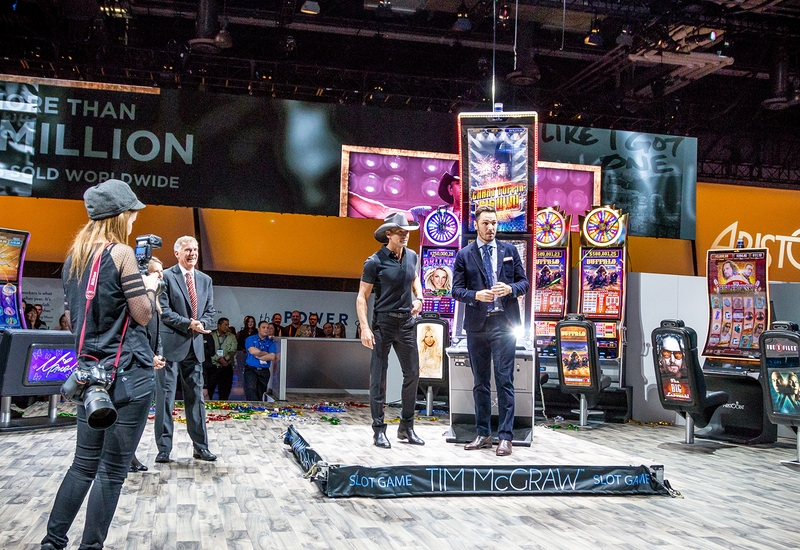 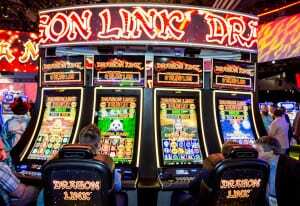 So when veteran gaming manufacturer Aristocrat prepared to unveil its highly anticipated Tim McGraw machine to the event’s 26,000 attendees this fall, it rolled the dice with a bold stunt that ultimately got the entire show floor buzzing. 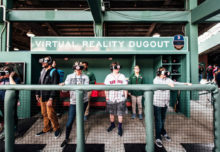 It all began with some pre-activation hype. 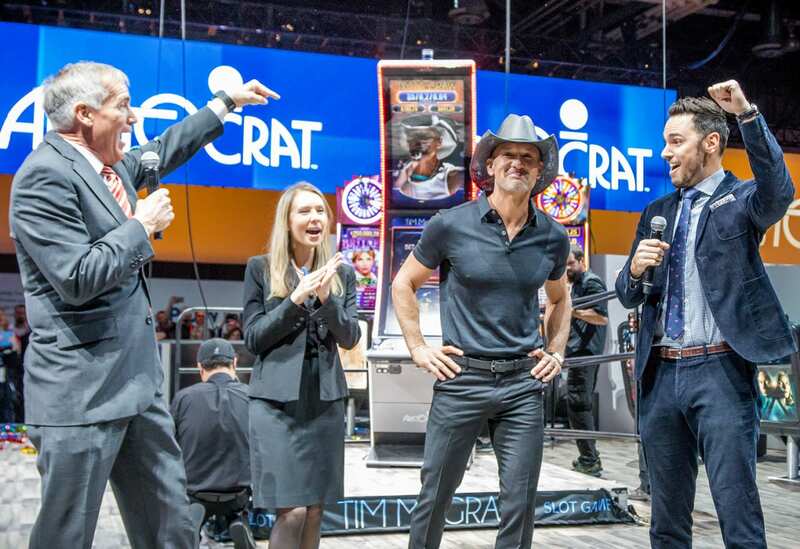 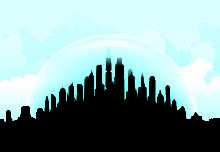 From the beginning of the conference, Aristocrat promoted its Tim McGraw game reveal as a can’t-miss event. To add to the buzz, the brand unleashed a sea of Tim McGraw lookalikes across the expo floor (cowboy hats and all). 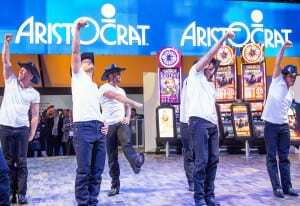 A troupe of male dancers also performed a routine to McGraw’s upbeat hit “Truck Yeah” inside Aristocrat’s booth as a precursor to the brand’s “wow” moment. 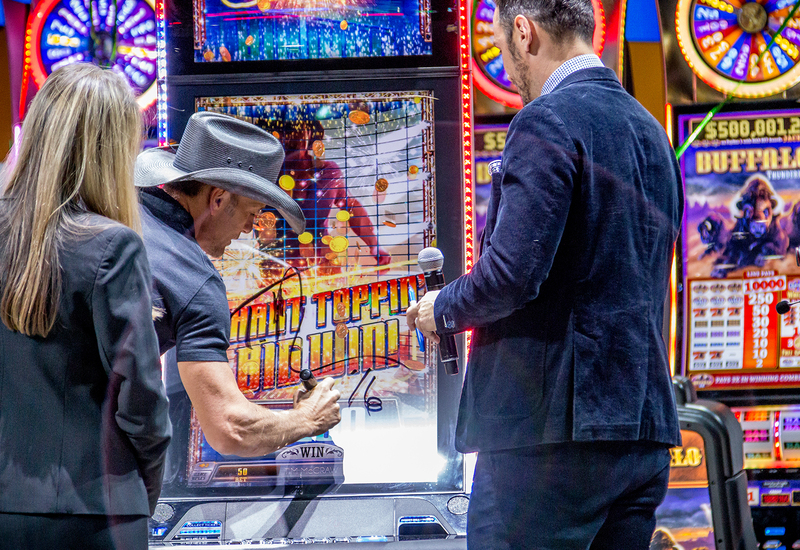 When the performance came to a close, it was time for the grand unveiling. 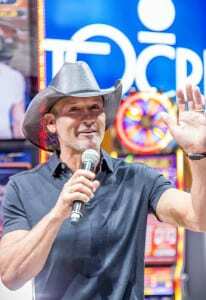 As both casino operators and Aristocrat’s biggest manufacturing competitors looked on, a platform lowered from the top of the convention center ceiling carrying the brand new Tim McGraw machine—along with the country music star himself, in the flesh. It was a first-of-its-kind moment in G2E history. 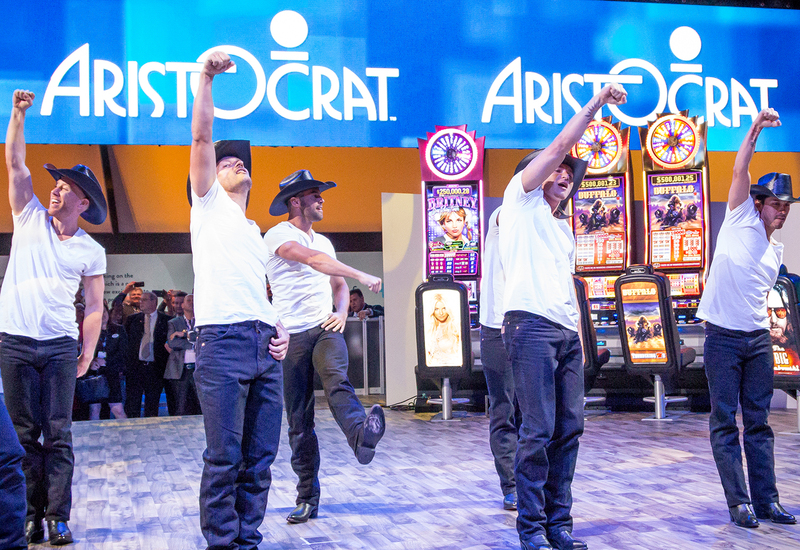 When the platform reached ground level atop a small stage built into Aristocrat’s booth, McGraw was met with the brand’s leadership team and a roaring crowd. Confetti falling all around the stage added to the ambience. 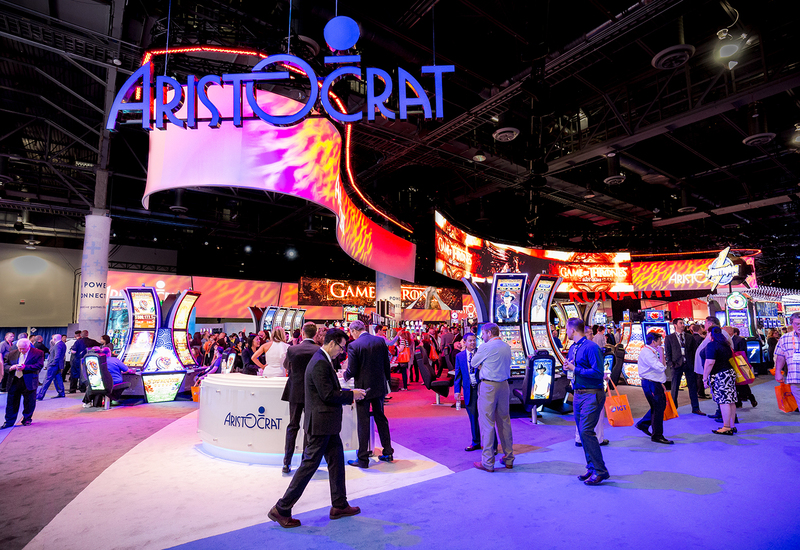 Although the McGraw stunt was the centerpiece of the activation, Aristocrat offered a handful of other touchpoints inside its booth to draw the casino operators in attendance. 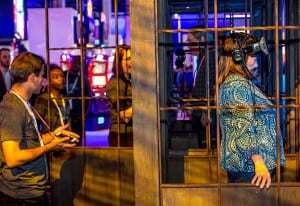 A virtual reality experience produced in partnership with HBO helped the brand promote its Game of Thrones product, while two performances of traditional Chinese lion and dragon dances helped hype its Dragon Link game. 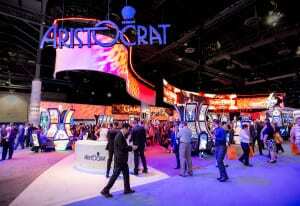 Sprawling LED screens, myriad gaming stations and sleek, private workspaces for networking were also part of the mix. 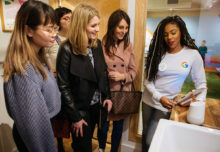 “We want to be able to say to customers, ‘Hey we’re thinking about your business and the things that we can do to help support your business and support your floor,’” says Wofford. 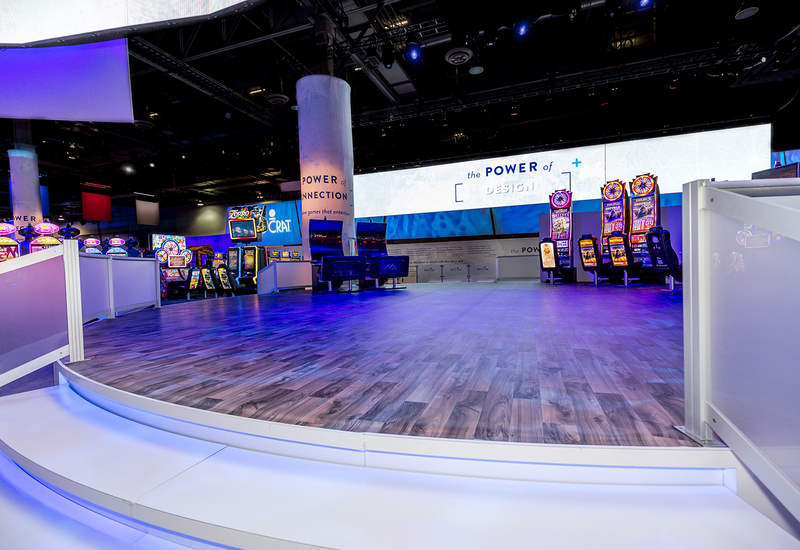 “That’s why we envision these types of events and work really closely with our customers to help them bring that stuff to life. 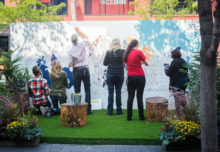 They’ve got 365 days to fill with marketing activations and events so if we can help with a few of those and give them some ideas and the toolkit to be able to do so, we definitely want to provide that as a value-add. 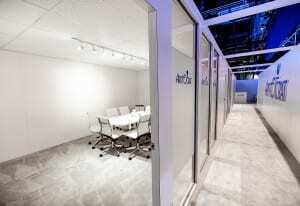 That idea generation is valuable.” Agency: Sparks, Philadelphia.